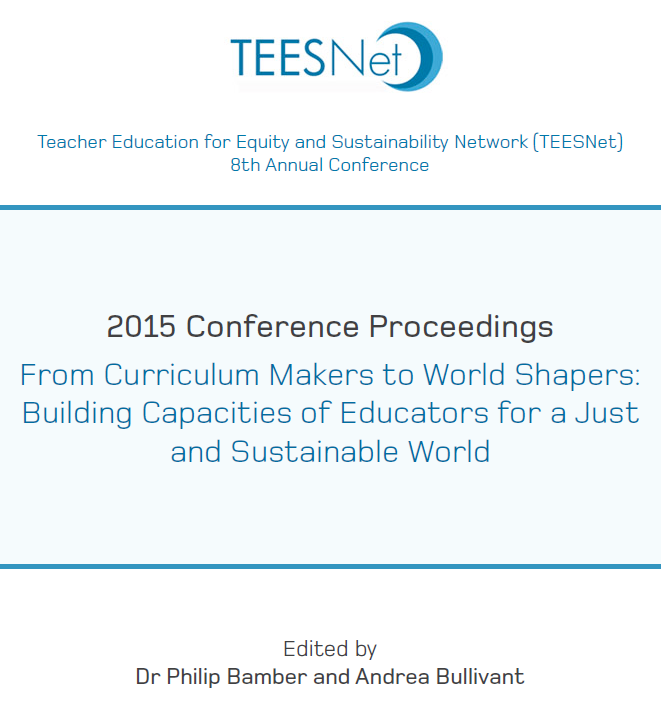 This page contains information about previous TEESNet conferences. Please feel free to contact us with any questions! The 10th annual TEESNet conference took place on 14th September 2017 at Liverpool Hope University. We welcomed 100 individuals from universities, schools, NGOs and more to Liverpool, including delegates from Finland, Switzerland, Malta, Norway and Holland! Links to presentation and workshop slides can be found below. Vikki Pendry – We’ve Got the Whole World in Our Hands? Our colleague Stephen England from The Art of Sustainability wrote AoS ESDGC 2017 following the conference. Measuring What’s Valuable or Valuing What’s Measurable? TEESNet 2016 took place on the 21st September at Liverpool Hope University. With a range of relevant and stimulating presentations and keynote speeches, the conference brought together academics and researchers, teachers and NGOs to explore opportunities and challenges in monitoring and evaluation of education that supports people in leading fulfilling lives in a changing, globalised world. 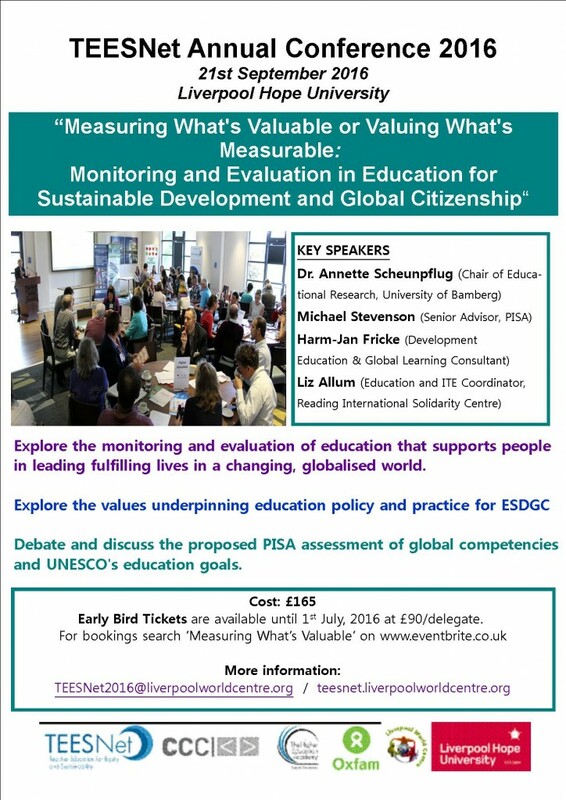 This year’s theme was a response to growing interest in monitoring and evaluation in ESDGC. We also provided opportunities to explore the values underpinning education policy and practice for ESDGC and provide a forum to debate the proposed PISA assessment of global competencies and UNESCO’s education goals post 2015. 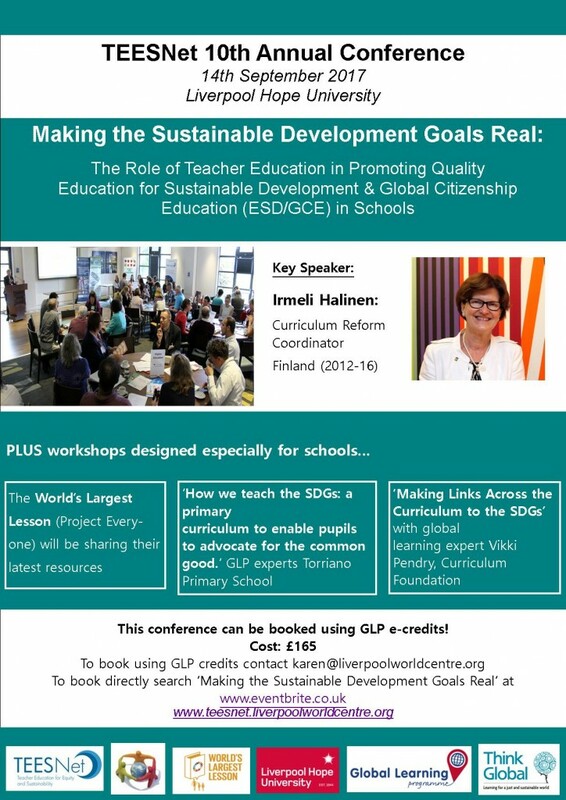 This conference built on the 2014 theme of ‘The Role of Education for Sustainable Development and Global Citizenship in a Meaningful Curriculum’ It sought to address a priority action area in UNESCO’s Global Action Programme on ESD and the ‘global call for more and better global citizenship education’, to focus on the knowledge, skills and values required by educators to make this vision for the curriculum a reality. This conference explored the role of ESD/GC in contributing towards a meaningful curriculum, both in teacher education and schools. It sought to examine what is meant by a meaningful curriculum and evidence of ESD/GC’s movement towards a central role, drawing on latest research and examples from different educational contexts both in the UK and internationally. Dr Neda Forhghani-Arani, University of Vienna. 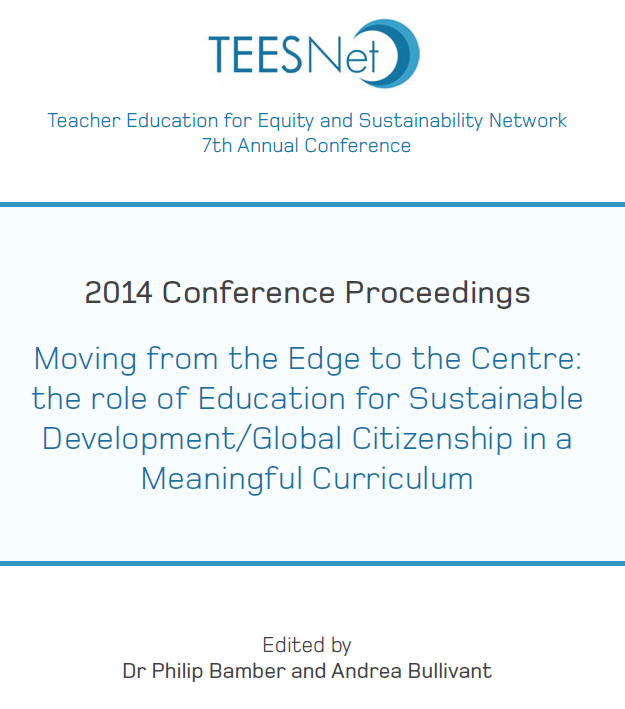 What is involved and what is at stake in teaching for Global Citizenship within national curriculum frameworks in the transnational and transcultural space of classrooms with diverse students? In an attempt to move beyond the frame of catalogues and criteria of teachers’ diversity, ESD and GC competencies, I set out to explore the experience of teaching in culturally, ethnically, nationally and linguistically heterogeneous classrooms characterized by transnational migration, in terms of practical wisdom, judgment and tact. Teaching for sustainability – why it should be at the core? An aspiration within Scotland is to embed learning for sustainability at the core of what teachers and educators do. We have a proud tradition, but how do we maintain and develop this further? Education Scotland sees this as an important question and, working with partners, is supporting delivery of that aspiration. Jackie Zammit and Rob Unwin Core Competencies for Global Citizenship? Developing a curriculum to embed ESD in undergraduate ITE Cordery, Jackson, Sinclair. Devloping a curriculum to embed ESD in undergraduate ITE part 2. Developing ESDGC Scoffham, Whyte Tagart. Ethco – Your Future Role Linda Brownlow. Exploring justice and fairness through conflict.Coffey, Grindle , Love. Making a difference Mc Callum, Brook. Rights as Powerful Knowledge Jonathon Hart. Stand Against Violence Bennett, Fouracre. The Global Dimension in Initial TeacherEducation John Morgan, Hannah Li Ting Chung. Clive Belgeonne and Bev Booker – Developing Global Citizenship and Sustainable Lifestyles through Carbon Justice. Janet Ramdeo – Voiced perspectives on ‘difference’: using narrative to examine lived experience of Black and Minority Ethnic (BME) trainee teachers on an employment-based route.